John Lam just announced that the Dynamic Silverlight bits are now available. 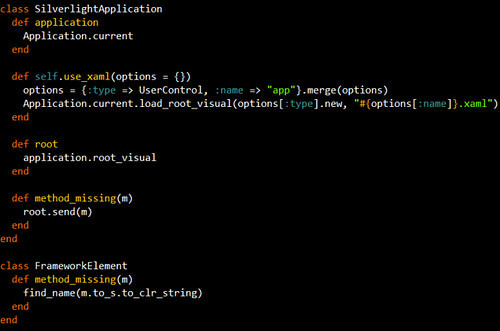 What that does is enable you to write code targeting Silverlight in Ruby (IronRuby) or Python (IronPython). The Dynamic Silverlight bits are implemented as Silverlight extensions which means that they will be downloaded on an as-needed basis. The additional download is currently about 712KB download in size. If you are interested in looking at running Ruby in the client on the desktop in addition to if you are running Ruby on the server, this might be of interest to you. Check it out and some of John's tutorials as well as an update on IronRuby from his MIX08 session.